Great post! Even though I was on team “agree”, I to see the value in memorisation of things that will help us function and succeed in everyday life such as counting money, driving or walking as you mentioned above. However, children absorb information and retain it at a progressively higher rate than adolescents and adults and these are all things that require repetition as well. Therefore, I would argue that when it comes to higher level thinking and more abstract concepts, memorisation does not necessarily aid in the success of our students. It is at this stage that critical thinking skills and the ability to take information and apply it to different concepts becomes important. 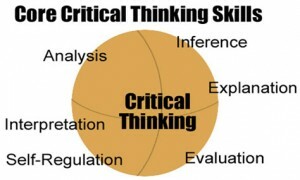 I agree that students must develop critical thinking skills to properly navigate information the internet provides them with but also that the internet can be used as a tool to further build critical thinking skills. I really like the examples provided in the article by Jessica Mansbach that you spoke to above regarding the use of discussion forums and reflection activities! Thanks for the share!! Kristen you nailed it with the comment – “at a very early stage…how to learn is largely their responsibility”. We as teachers are the ones who often communicate to families, when students are behind. Some students lack the motivation and as teachers we get blamed but I think we need to higher our standards for achievement. Far too often, students are given too many chances for late assignments and I feel we coddle kids too much. In reality, when you have a job, for example as a teacher and you do not enter your report card comments – that is on you. You had a job with a deadline that you did not meet. Students do not always have the sense of urgency and will do the bare minimum to get by. I think we can apply the idea of students needing to be able to search for information to things beyond the internet as well. Perhaps they can use tools like Google to search for an expert in a certain field but having the skills to connect with and communicate with that expert is something we need to be teaching students as well. I fully agree that balance is the key. I think that the evolution needs to happen within our curricula however, regarding what SHOULD be memorized and what COULD be Googled. I think that instant access from memory is completely necessary for some things. You mentioned driving a car, for example. It would be rather dangerous to have to Google street signs every time we see one. The difference might lie in accessing appropriate knowledge for certain conditions. However, applying knowledge to analysis and creativity will enhance memorization into a more functional condition and will help students move beyond rote regurgitation of knowledge to functional usage. I believe that we need to UNDERSTAND why and how something works, like government or multiplication, before we worry about memorizing the details around it. Quite honestly, I have memorized tons of information for tests over the years. However, once the test was over, most of that information was gone. In contrast, I have Googled loads of information to write papers for 18 masters classes and inform my teaching. I have internalized that information through analysis and application and made it usable. Google did not hurt my ability to continue to develop my knowledge. It was a necessary component of my 21st century learning.